China passed Japan in 2010 to become the world’s second-largest economy after the U.S., a historic shift that has drawn mixed emotions in the two Asian powers: resignation tinged with soul-searching in long-stagnant Japan, pride but also caution in an ascendant China wary of shouldering new global responsibilities. WSJ Assistant Managing Editor John Bussey is joined by Beijing Bureau Chief Andrew Browne and Tokyo Bureau Chief Jacob Schlesinger to discuss China overtaking Japan as the world’s #2 economy. The Japanese government made official the long-expected flip Monday morning in Tokyo, reporting that the economy shrank at a 1.1% annual rate for the last three months of the year, a period when China’s gross domestic product surged 9.8% from a year earlier. With those figures, Japan’s full-year GDP was $5.47 trillion—about 7% smaller than the $5.88 trillion China reported in January. Both still remain considerably smaller than the American economy. 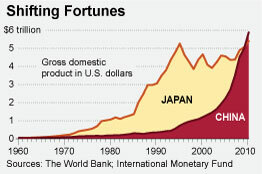 Japan and China combined are still worth less than the U.S.’s 2010 GDP of $14.66 trillion. But the news marks the end of era. For nearly two generations, since overtaking West Germany in 1967, Japan stood solidly as the world’s No. 2 economy. 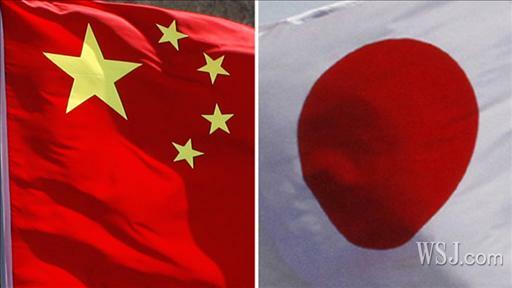 The new rankings symbolize China’s rise and Japan’s decline as global growth engines. For the U.S., while Japan was in some ways an economic rival, it also has been a geopolitical and military ally. China, however, is a potential challenger on all fronts. China’s ascent has been the main source of popular legitimacy for the ruling Communist Party. But Beijing worries that the mantle of economic titan comes with unwanted obligations for a country still in many ways poor. “China Surpassing Japan to Become World’s Second Biggest Economy—But Not the Second Strongest,” said the headline on a recent article on the website of the People’s Daily, the party’s flagship newspaper. China passed Japan in 2010 to become the world’s second-largest economy after the U.S. Compare the two economies over the past 50 years. 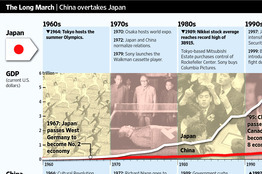 Take a look at major events in Japan and China over the past decades. China’s per capita income is still only a tenth of Japan’s. The World Bank estimates that more than 100 million Chinese citizens—nearly the size of Japan’s entire population—live on less than $2 a day. Robin Li, chief executive of Chinese Internet search giant Baidu Inc. notes: “There’s still the undeniably awkward fact that China still has yet to produce an enterprise with truly global influence commensurate with China’s rising power,” such as Toyota Motor Corp. or Sony Corp. Still, there are clear strains, with historical tension lingering from Japan’s brutal wartime occupation, and China flexing newfound muscle against a weakened neighbor. The recent defining moment: last fall’s standoff over disputed islands near Taiwan, ending in Japan’s sudden release of an arrested Chinese fishing captain under pressure from Beijing, despite video evidence that the captain had violently charged a Japanese coast guard vessel. For Beijing, being No. 2 means, among other things, new clout. China has trumpeted its willingness to use its $2.85 trillion hoard of foreign-exchange reserves to help stabilize struggling countries such as Greece by purchasing their bonds. Officials have chastised Washington for monetary policies they say could endanger the value of China’s massive holdings of U.S. government debt. At home, the rise to No. 2 complicates the Communist Party’s national narrative, steeped in a sense of victimhood at the hands of foreign powers—not least 1930s Japan—that China is now overtaking. Party leaders are aware that China’s image as an economic powerhouse risks calling attention to the shortcomings of a country both powerful and poor. So the government takes credit for China’s economic accomplishment while playing it down. When the National Bureau of Statistics reported China’s 2010 GDP last month, director Ma Jiantang was asked about the looming No. 2 milestone. The rise “is the result of hard struggle and continuous progress of the Chinese people under the leadership of the Communist Party,” he said—adding that China remains one of the world’s poorer countries on a per capita basis. In the 1980s and 1990s, Japan faced the same pressures China now fears, of global demands to shoulder extra responsibilities. China’s official rise to Asia’s top economy takes the spotlight off Tokyo. While still the oldest liberal democracy in East Asia and a cornerstone of the U.S. defense umbrella, Japan no longer faces the same pressure from Western peers to exercise “checkbook diplomacy” or open its markets—even though Japan’s trade surpluses with the U.S. remain high. For others, the debate is on to define Japan’s role and image for the era of No. 3. One influential Japanese ruling-party politician, Renho, who uses only one name, touched a nerve last year with her book titled “Do We Have to Be No. 1?” It encouraged Japanese to take comfort in the notion that Japan need not be a leader in everything—or anything—to be considered successful. 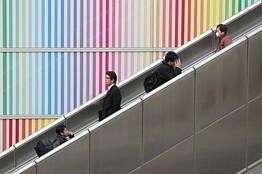 Japan now is more focused on different, less-quantitative, ways of defining success. Its influence abroad remains extensive, and in some ways has grown. But it is more low-key, less directed in contentious areas of strategic technology and more in the realm of cultural diplomacy. The notion of Japan as a center of creativity and innovation—in hybrid-engine-powered cars or 3-D videogames—contrasts with its image 20 years ago as a copycat that mimicked design and technology pioneered elsewhere, and then outpowered the original makers with superior manufacturing. That label is now attached more to China. and Juro Osawa in Tokyo contributed to this article.